What is a pork picnic shoulder, and what's the best way to cook it? And why does it taste so darned good? I'll answer the last question first. A pork picnic tastes great because it's a tough cut of meat. If that sounds like a contradiction, you need to know that it's not. Tough cuts of meat contain a lot of connective tissue. And when connective tissues are exposed to relatively low temperatures for a long time, they soften up. Part of the tough tissue liquefies into a gelatin-like substance which tastes very good, and at the same time makes the meat really moist. Another reason a picnic tastes so good is that it's a fatty piece of meat. As the meat slowly cooks, the fat melts, basting the meat from the inside out, adding flavor and moistness. The picnic is one of the most inexpensive cuts of pork you'll find. The reason? High fat content, lots of connective tissue, and a big ol' bone inside, which for most people are negative factors. But for us meat smokers, those are positives, because they add flavor and moistness. Yes, even the bone! Some skin is almost always left on this cut of pork, too. It can be trimmed off completely, or partially. 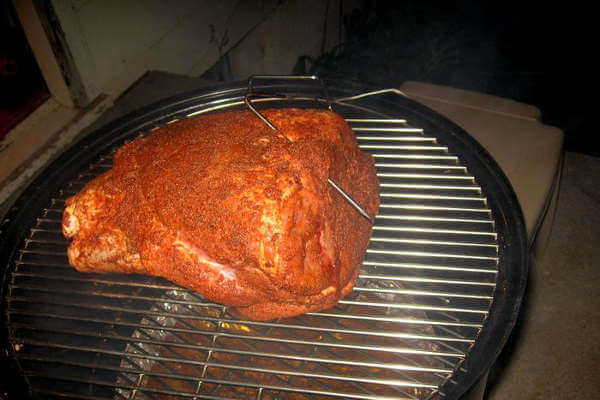 I like to leave the skin on one side, to protect the meat from the heat in my Weber Smokey Mountain. 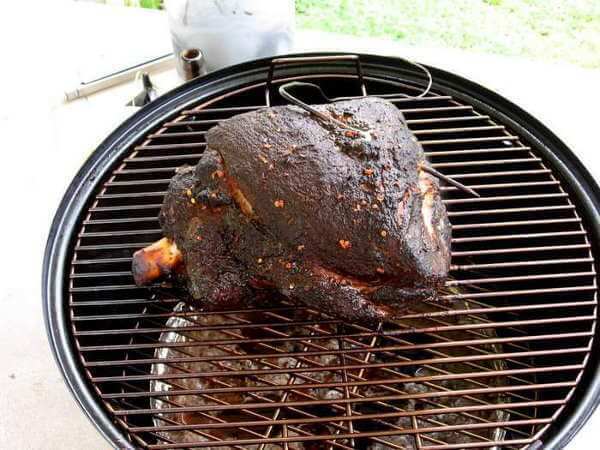 The pork picnic shoulder includes the foreleg and shoulder of the hog. It's often cured to make picnic ham. Other good ways to cook include braising, roasting, baking and simmering. The high fat content helps it remain internally moist when cooked using dry methods (roasting, baking and barbecuing), even though the outer surface will dry some. Braising and simmering in water are moist cooking methods that bring the meat to tenderness without drying. The benefit of dry cooking is that the meat can be cooked at a temperature higher than that of boiling water. Moist cooking methods keep the cooking temperature at or below 212 degrees Fahrenheit. A water smoker provides the best of both worlds. The picnic shoulder contains the arm bone and the shank bones. The shank is commonly smoked to make ham hocks, which are great for flavoring soups and beans. The more meaty part that wraps around the shoulder joint can be sliced, or if cooked more completely, ripped apart to make bbq pulled pork for sandwiches. You normally won't have to deal with a tough pork picnic shoulder if you allow it to cook long enough, and to a high enough temperature. Shoot for around 195-205 degrees Fahrenheit. Begin testing it for doneness with a fork at 195 degrees by inserting the fork tines and twisting. When the meat is tender enough to pull apart, it's done. Time for pulled pork sandwiches!